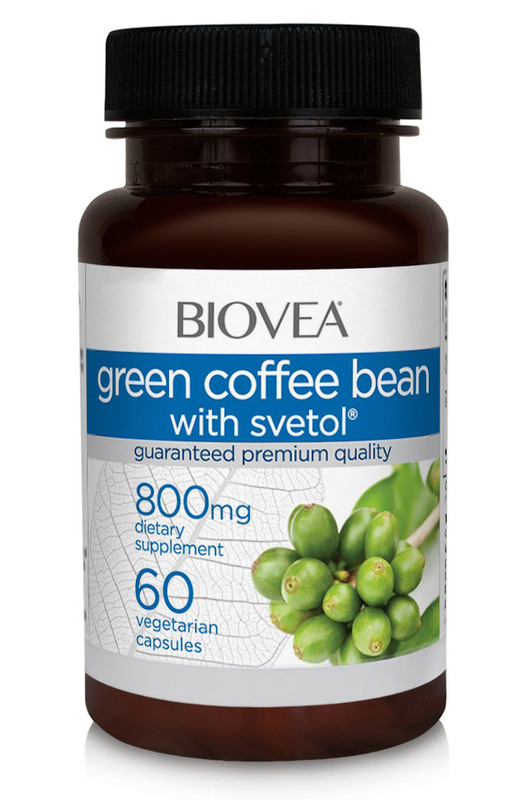 What is Green Coffee Bean with Svetol®? GREEN COFFEE BEAN WITH SVETOL® contains two types of raw, unroasted green coffee bean extracts that are potent with 45% chlorogenic acid, caffeic acid, 3-4-5 caffeoylquinic acids, dicaffeolyquinic acids and other natural active compounds. These combined ingredients are clinically proven to promote healthy blood pressure, help burn fat and maintain healthy blood sugar levels. Low in caffeine, rich with polyphenols and antioxidants, GREEN COFFEE BEAN WITH SVETOL® extract supports cardiovascular function, fights signs of ageing and assists with weight management without overstimulation. How Does Green Coffee Bean with Svetol® Work? Svetol® (Chlorogenic Acids): safe and effective plant extract that helps lower fat content while increasing natural beauty inside and out. Found to prevent oxidative damage, Chlorogenic Acids bind lower density lipoproteins (LDL cholesterol) while supporting healthy blood pressure and homocysteine levels. Chlorogenic Acids also protects the heart with all natural antioxidants. Clinical research suggests that chlorogenic acids are the driving force for superior weight loss! First Stage: chlorogenic acids inhibit the absorption of glucose (sugar) in the small intestine, which limits the amount of glucose absorbed. Second Stage: when blood sugar levels are low, chlorogenic acids inhibit the release of more sugar into the blood stream from the liver. Third Stage: lastly, the body naturally burns the energy stored in fat cells as fuel. Why Take Green Coffee Bean with Svetol®? GREEN COFFEE BEAN WITH SVETOL® is made with only the purest and highest quality green coffee beans that have been standardised to contain 45% chlorogenic acids, giving you the most effective weight loss and cardiovascular results!